This post is a little belated. I got my copy of Patricia Smith’s critically acclaimed collection of poems Blood Dazzler last week. Even still, it’s never too late to talk about a great book. In case you didn’t already know, this book is Smith’s tribute to the people of New Orleans and their struggle before, during, and after Hurricane Katrina. In my opinion, Smith is successful because she’s aware of all the possible perils a writer faces when taking on a time specific disaster. After being inundated with media coverage about Katrina, there’s always a risk that people will roll their eyes whenever someone brings it up in literature. Other risks include being too serious, too distant, too inspirational, etc. Smith deftly writes in a way that reintroduces us to the City, the Storm, and the Story as she sees it. Katrina herself is given several first person monologues and she’s not a very nice person, not at all. She’s young, misunderstood, and angry. There are poems about various victims, including a dog left behind by his own. (Try not to get a little weepy when you read about Luther B. I dare you!) I don’t want to spoil the book for you because I want you to go out and get a copy. This is poetry that matters. This is Patricia Smith giving us what we’ve been waiting for. Also, Blood Dazzler was recently named as a finalist for the National Book Award. On November 18th, I will be in the audience as Patricia Smith and the other finalists read their work. I can’t wait. Splinter Generation is an online anthology of work by and for people under 35. Three of my poems are featured on the website. Yay. It’s worth mentioning that “It Means Something Different in Arabic” originally appeared in the May 2007 issue of StorySouth. Last night was the second installment of the Writers @ Newark Reading Series. Matthew Klam, author of Sam the Cat, and Richard McCann, author of Mother of Sorrows, reading excepts of their work and took questions from the audience. What’s interesting is that although both authors have very different styles, the pieces they read seemed to speak to one another. Good times. Good reads. I’ve always prided myself on being a night owl. I used to brag about avoiding homework, writing, reading, anything important until around eleven pm. Whenever the subject of preferred writing times came up, I argued that I did my best work with a can of red bull beside me. That was before I started graduate school. As a full-time MFA student who’s also teaching an undergraduate course, the reality is that I’m running on a very different schedule than I’m used to. For one thing, the class I teach starts at 8:30 am. That alone makes writing into the wee hours of the night look foolish, but more importantly, it’s often difficult for me to write late in the evenings because, by then, I have way too much going on in my head. It’s difficult for me to write the way I want to – free of pressure and with enough time to allow myself to linger over words and make all kinds of changes – when my mind is racing from everything that’s happened in the whirlwind I call a day. When I wake up early in the morning to write, however, I feel like I have a clean slate. 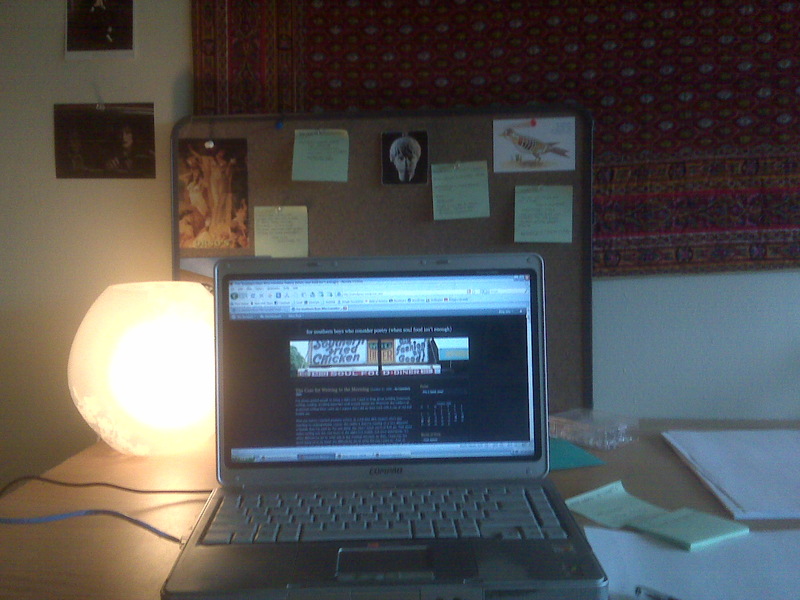 I drink tea (albeit caffeinated), meditate, and sit down at my desk. Another benefit of waking up early is that it’s quiet outside as well. I’ve decided that Newark (or at least the part of Newark outside my bedroom window) is a very loud city – traffic, sirens, screaming homeless people (I’m serious), and more sirens. If I wake up at 5 am, my writing beats the noise that comes with a day in the city. Now, I don’t always write so early in the morning. Sometimes I really do need to sleep in, but my point is that, unlike a few months ago, I now see the morning as prime real estate. Whether or not, I take advantage of it is up to me, but it’s nice to know it’s there if I want it. As you know, I’m in a workshop this semester with formal poet Rachel Hadas. I must admit that, in the weeks leading up to school, I was a little nervous about the thought of iambic pentameter and such. Rachel’s workshop, however, has turned out to be quite a joy. Yes, form is challenging. 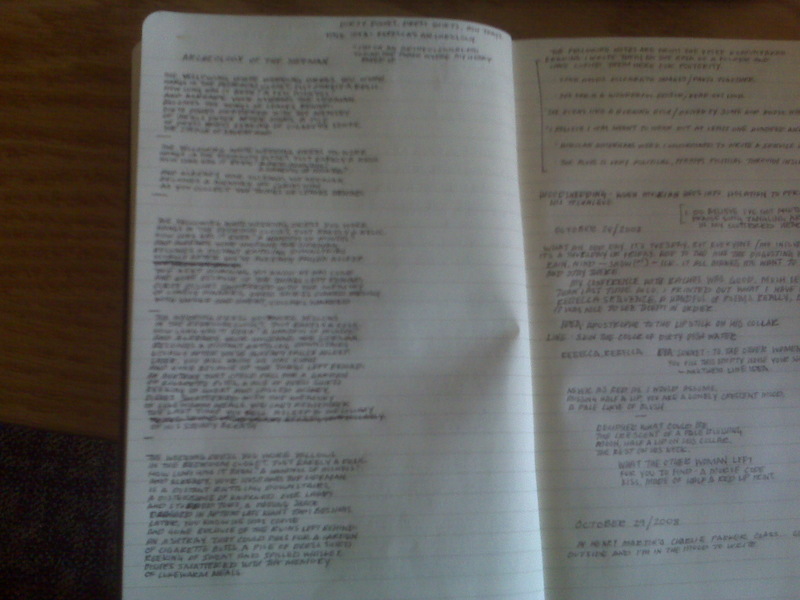 Yes, sometimes writing a formal poem takes much, much longer than I’m used to. But – it is also true that there is a sort of freedom to be discovered in form. It’s nice to know that the line breaks and the structure have been laid out for me. In particular, I’ve enjoyed the forms that make use of repitition and the Villanelle certainly qualifies. Before you start writing one of these bad boys, may I suggest reading One Art by Elizabeth Bishop and/or Do Not Go Gentle into That Good Night by Dlyan Thomas – among others. It’s always helpful to see what other writers have managed to do with the form. It gives me a little help and a little hope.